We recently had the opportunity to get out of the office and put our video equipment to good use on a short commercial for The Kater Shop in Logan, Utah. They were eager to get fresh video content for their website and social media platforms that could showcase their new location and their expanded inventory. We met a week before the scheduled shoot so that we could plan out what shots we wanted to get and what sort of look we were going for with this video. 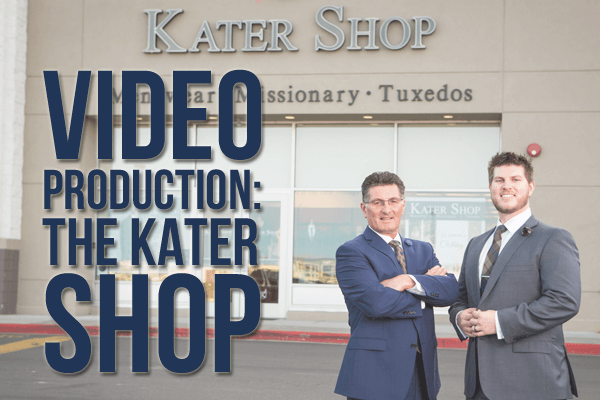 Mike and Chris Hammond, the father-son duo behind The Kater Shop, shared their ideas for what content they wanted in the video and what features of their new store they wanted to highlight. On the day we filmed, we got to the store early so that we could get all of our footage before customers starting coming in. We were also able to film the clouds moving over the store as the sun came out (seen at the end of the video), which was an added bonus to the early morning. We wanted to get a variety of shots to work with, and the Kite Media team thought that a time-lapse of the storefront would be the perfect way to feature the new location. Inside, Chris and Mike were ready for us with a script and several options for filming the intro. We chose a setting and got Mike hooked up with the microphone to begin. Chris knew he wanted the opening shot to be of his father speaking, as if to a customer, and then a continued explanation of the store’s products and services as we showed off their clothing and accessories. We had Mike memorize the first portion of his script: just enough for our opening shot of him speaking, and then he was able to use his cheat sheet for the rest of the voiceover. It was fun to see the coordinated efforts of the entire team to get everything to flow smoothly. We recorded the on-camera audio with a Rode VideoMic Go and also used the Rode Smartlav+ connected to an iPhone to record Mike’s voiceover portion. We spent the next hour and a half filming a list of inventory that Chris wanted to show off, including their new and improved (and expanded!) women’s department, their many varieties and combinations of tuxedo rentals, and their impressive stock of men’s suits, dress shoes and accessories. The suit collection spans the whole depth of the store along one wall! It took some fancy footwork by Garrett to maneuver the entire length of suits without catching himself on camera in any of the dressing mirrors. The majority of the commercial was filmed using a video tripod with a fluid head for the smooth panning shots, while a portion was also filmed on a Glidecam HD-2000. Once we completed filming, the real work began as we sorted through all of the footage that we captured to edit the video. We had the tough task of taking about an hour of video footage and cutting it down to a 45-second finished commercial. We chose the best shots and pieced them together to make a final product that fit within the target time frame and still included all of the requested shots from Chris’ original list. We’re happy with how the end product turned out, and, more importantly, so are Chris and Mike! We would love to work with your business to produce a beautiful video showcasing your products and services. Give us a call or send us a message to discuss what we can do for you.